O Varadha! ( Bestower of Boons! )Those Bhakthas who constantly chant Thy names and worship Thy divine Form and they are engaged in narrating Thy divine stories and so revel in the ocean of Bliss. they are immersed in the joy of Thy thoughts. I consider those devotees of Thine most fortunate, They, indeed, have fulfilled all their desires in life by Thee and are indeed the most blessed souls. O Lord of Guruvayoor, Due to my intense physical sufferings,I do not even feel inclined to serve you as my mind is pulled away by the intensity of physical pain. Kindly remove my afflictions. Please have pity on me and help me to sit peacefully in some quiet place chanting(I) becoming immersed in worshipping Thy lotus feet.I will keep singing Thy countless names. O Guruvayoorappa! If Thy grace is achieved what is there that cannot be achieved? There are Innumerable devotees ofThine have been liberated from their sorrows and worldly ties by Thy mercy. Can I notbe one such fortunate devotee of Thine? O Guruvayoorappa! Great sages like Naarada (who)are well known in the world, have attained Supreme Bliss by meditating on Thy lotus feet and now free to wander will without being noticed. They are free of all sorrows because of their constant contemplation on Thy lotus feet.indeed, They have attained the eternal knowledge and are always immersed in Thy in the complete state of conscious Bliss beyond all limits of time and space. Is there anything more for them to attain? O Guruvayoorappa! Please help me to become more and more devoted to Thee. May my devotion to Thee grow intense, so that all my sufferings may automatically subside and as that is the only remedy for all my woes. I do not have the slightest doubt in my heart that devotion to Thee . For otherwise, all ofVyasa's teachings, Thy divine sayings and even the Vedas will become meaningless the casual mutterings of street wanderer. O Lord! Chanting Thy names and singing Thy praises is a sweet right from the beginning because of Thy glorious attributes. When such devotion becomes intense, it removes all sorrows of the devotee.Then ultimately it leads the mind to the path of supreme knowledge and bliss. What more is there for one to seek? O Lord of Guruvayoor, Due to my intense physical sufferings,I do not even feel inclined to serve you as my mind is pulled away by the intensity of physical pain. 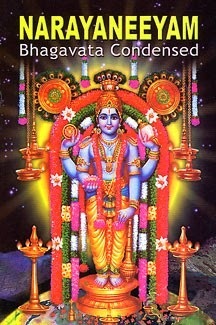 Kindly remove my afflictions so that my feet may be able to walk up to your temple,my hands may be able to worship you, my eyes may be able to have vision of you,my nose may be able to smell the fragranceof the Tulasi leaves offered at your feet and my ears may hear your glories sungand May Thy divine form embodying the Supreme Bliss envelop my mind and heart so completely that I am forced to forget all my physical maladies and experience only thethrill of shedding tears of joy in this state. O Lord! In my mind, which is now very agitated due to mental and physical afflictions, May Thy divine form embodying the Supreme Bliss envelop my mind and heart socompletely that I am forced to forget all my physical maladies and experience only thethrill of shedding tears of joy in this state. O Guruvayoorappa! Many who are not even your devoteesare seen leading a happy life.But I, your devotee am undergoing various sufferings. Why is this so? Oh Varada ! Is not Thy reputation of mercy to Thy devotees at stake here ? Oh Lord ! Kindly eradicate my afflictions. It is not a great thing for you to eradicate my ailments. O Lord, may my devotion to you become perfect and make me one of your foremost devotees!That alone can remove all my sufferings. O Guruvayoorappa! What else is there for me to pray for ? I will be giving up lamentations of all kinds and spend my time doing Therefore, O Lord of Guruvayoor,I am not going to leave you.Until I get your grace,I shall serve you, worship you,sing before you, serveand seek your grace to the best of my ability. Kindly eradicate my diseaseand enable me to be the best of your devotees.